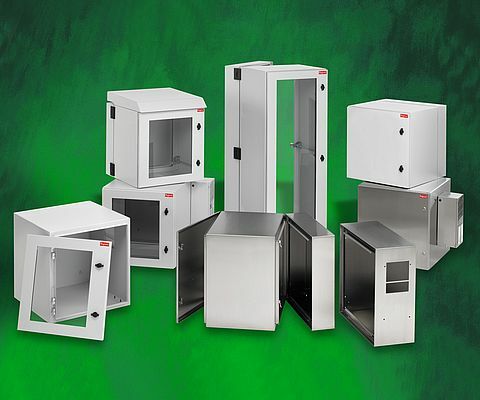 Available in a wide selection of sizes, materials and configurations, Pentair Technical Products’ Hoffman brand line of PROTEK wall-mount enclosures provide protection, support, thermal management and easy access to rack-mounted, 19” panel and other sensitive electronics. Standard models include single- and double-hinged door configurations. The latter facilitate front and rear access. The cabinets are UL and CSA listed and are available with solid or window doors. They offer robust protection against water, dirt, corrosive agents and other contaminants, as well as industrial environmental challenges, including high temperatures, impact and security requirements. A choice of material options, including stainless steel and NEMA Type 3R, are available to suit specific application requirements. Additionally, pre-packaged cooling solutions, including Type 3R fan and air-conditioned models, help protect sensitive components by maintaining the desired temperature in both indoor and outdoor environments.